Market last week was a truncated one, but nevertheless it was full of action. The week began on a subdued note and Nifty closed at 2573 on Monday. But it held the support at 2550 and rebounded strongly on last two days of the week to close at 2720, gain of about 170 points from the lows of the week. Global markets too, recovered after a initial setback in the beginning of the week. Dowjones index recovered from an intra-week low of 6516 to close the week with a whopping 10 per cent gain. European indices such as the FTSE, CAC and DAX recovered from multi-year lows on Monday to close with weekly gains of about 10 percent. Most of the Asian indices gained about 5% for the week. So, what to expect next week ? The near-term resistance for the Nifty is at 2760/2800. Profit booking is expected around these levels. The 50-day moving average at 2810 adds to its significance. If 2800 isn't taken out, it will imply that the near-term outlook for Nifty stays negative and the index can reverse down to decline to 2650/2550. The current up-move is one of the sharp bear market rallies. A close above 2810 will make the near-term view positive for Nifty. Such a move will indicate that the index can move higher to 2900/3000 over the medium-term. On the other hand, a close below 2500 will take it down to 2250. Big move on the either side can be expected if either of the levels get breached. Reliance Industries: RIL witnessed a sharp up-move in the last two sessions that enabled it to gain about 10 per cent last week. RIL faces strong resistance at Rs 1,300/1320.Like nifty , RIL is also trading in a band of Rs.1150-1300. State Bank of India: SBI was weak and the stock declined to Rs 896 last week but staged a recovery to close at 950.A strong close above Rs 1,000 is required to make the short-term outlook positive for this stock.A downward reversal is expected from Rs 1,000,which could take it down to 900/860. Infosys : The stock closed the week with 6 per cent gain. The stock has strong resistance at Rs 1,320. 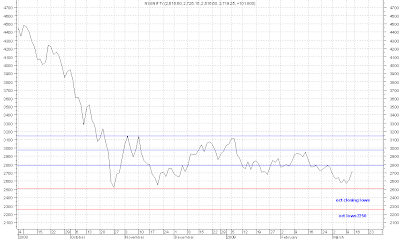 A downward reversal from Rs 1,320 will pull the stock down to Rs 1,200/1,150. RIL and banking stocks have seen a sharp reversal and hopefully continued bullishness overseas would keep the momentum going!